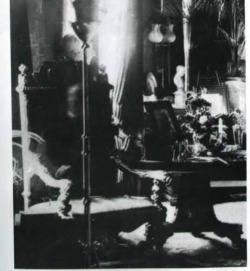 Taken in 1959 by Mable Chinnery, this famous ghost photo has an intriguing story. 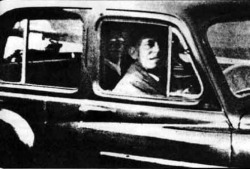 After visiting the grave of her mother, Mable turned and took a picture of her husband, who was waiting for her in the car. What Mable didn't expect was her mother coming along for the ride! Mrs. Andrews who was taking a picture of her 17 year old daughter's grave. Mrs Andrews was surprised by the ghostly image of a baby looking at her when the picture was developed.Mrs. Andrews maintains that no children were in the area, so a double exposure was impossible, and that she did not recognize the baby at all. Others who have visited the grave site have found the graves of two baby girls nearby. 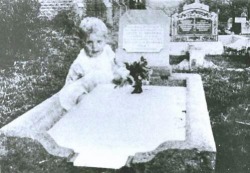 Could this baby over the grave be one of them? The SS watertown was an oil tanker which had a tragic accident occur. Two men were cleaning an empty cargo hold when they were both overcome with gas fumes and died, while steaming toward the Panama Canal. The sailors were buried at sea December 4, 1924. Beginning the next day, crewmen reported seeing the faces of the men in the water. When the SS Watertown arrived in New Orleans, the captain reported the incident to the company. It was suggested he photograph the faces should they re-appear on the next voyage. Captain Tracy took six photographs and then locked the camera in the ship's safe. 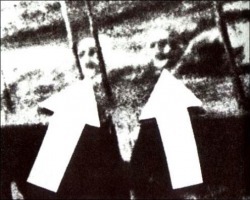 Upon return, one of the photographs recorded the faces of James Courtney and Michael Meehan. The men's faces were not seen again after the crew was changed..
November 19, 1995, Wem Town Hall in Shropshire, England burned down to the ground. As many spectators gathered around the old building consumed by flames (built in 1905), Tony O'Rahilly was one of the on-lookers who took photos of the scene with a 200mm telephoto lens from across the street. 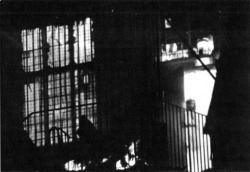 One of the photos showed what looks like a small, partially transparent girl standing in the doorway. Could this be a real ghost picture of slave girl Chloe, whose ear was cut off by Myrtles Plantation manager Clark Woodruff? 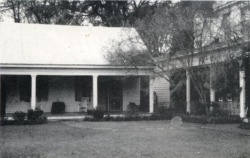 Take a close look and read more of the story regarding the famous haunted Myrtles Plantation. 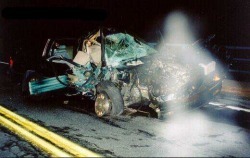 This angel or ghost picture commonly seen on the web was taken after an auto accident. The passengers in the car survived, which lead some to believe an angel assisted them. Is it a fake or real photo of a ghost or an angel entity? You decide..
Taken in 1936 during a photo shoot for Country Life magazine by Indra Shira, this famous real ghost picture of an apparition descending the stairs has been viewed round the world. Indra saw the white form taking shape and ordered his assistant to snap a picture of the staircase. His assistant, who did not see the white vapor, bet Shira that nothing would be in the picture - he lost five English punds on the bet. 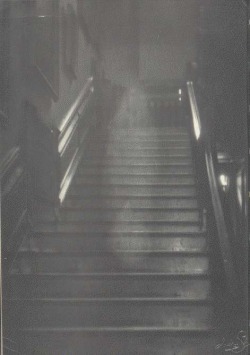 The home this famous, real ghost picture was captured in is Raynham Hall in Norfolk. King George the IV of England and others had seen a ghost deemed the Brown Lady before this photo was taken. She has not been seen since this 1936 photo.